Fed Raises Interest Rates, Signals 2 More Hikes This Year The Fed boosted a key interest rate again — its seventh hike since 2015. The move, which was expected, will trigger higher rates on credit cards, home equity lines and other kinds of borrowing. 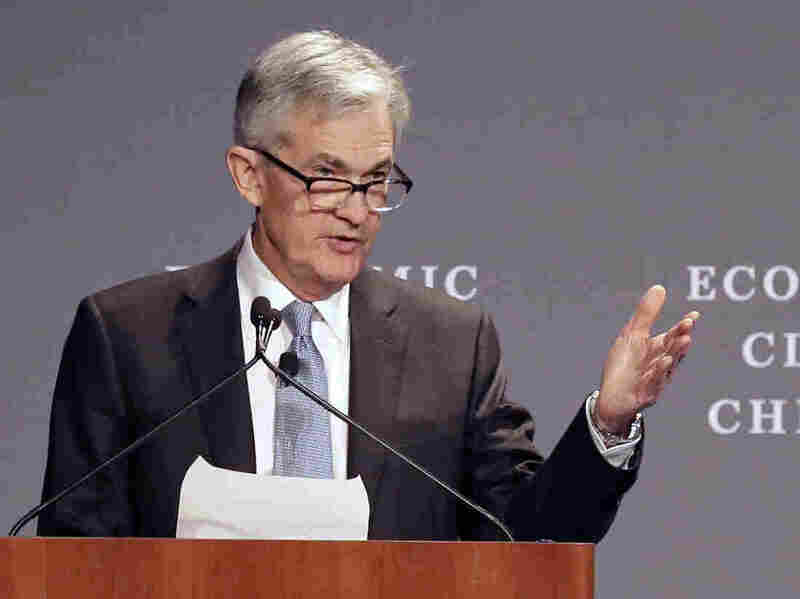 Federal Reserve Chairman Jerome Powell speaks before the Economic Club of Chicago on April 6. The central bank raised a key short-term rate by a quarter-point on Wednesday, the second increase this year. The Federal Reserve increased a key interest rate again Wednesday, which will trigger higher rates on credit cards, home equity lines and other kinds of borrowing. Wednesday's action, which was widely expected, was the second Fed rate hike this year — and the seventh since it began boosting them in 2015. The latest increase puts the federal funds rate in a range between 1.75 and 2 percent. The Fed previously nudged rates up in March. The Fed also signaled that it will raise rates more this year than previously expected — four times rather than three. With the unemployment rate at 3.8 percent — a level reached only twice before in the past half-century — Fed Chairman Jerome Powell and his colleagues have decided additional rate hikes will very likely be necessary later this year. In their statement, Fed policymakers noted that the labor market "has continued to strengthen and that economic activity has been rising at a solid rate." The Fed's latest projections show unemployment falling to 3.6 percent in 2018. Fed officials and many economists worry that the low jobless rate could force employers to hike wages faster, as companies compete for workers. That could spark higher inflation. At this point, there's been little evidence that wage or price inflation is accelerating. The Fed's new forecast showed inflation inching up only slightly over the next 2 1/2 years. The Fed has long aimed for 2 percent inflation, a level policymakers think is key to a healthy economy. Ian Shepherdson, chief economist at Pantheon Macroeconomics, said before the Fed made its announcement that policymakers are "scared of future inflation risk." And their rate increases are addressing the "perceived threat of inflation," not an immediate inflation problem, he said. Interest rate hikes will hit consumers in their wallets. Borrowers are likely to see higher bills next month on credit cards and mortgages, especially those with adjustable rates. Interest rates on new fixed-rate mortgages could also climb. The average 30-year fixed mortgage rate recently hit a seven-year high, before retreating a bit to 4.54 percent.